Until then, enjoy the new site! Browse through the different sections, check out my new RECIPES page, and let me know what you think about the new site in the comments below! I’d love your feedback and suggestions. And now I have to make it up to you guys for the 3 weeks I was out, so I hope you’re ready for some amazing NEW recipes coming your way, starting off today with one of my favorites, and the dish many of you have been waiting for! It’s My Mom’s Dosa Recipe! I am so excited to finally be sharing this recipe with you! If you follow me on social media, I’m sure you must have heard me mention it or share a pictures of this dish. It’s very simple and I’ve been making it for YEARS, so I am not sure why it’s taken me this long to post it. 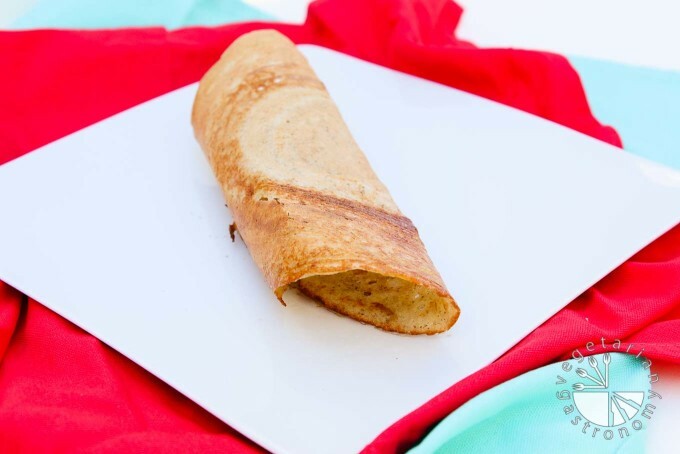 Dosa, a savory crepe made from rice and lentils. It’s a traditional South Indian dish, and a favorite of mine since I was a child. This awesome recipe was passed along to me by my Mom. She’s been making them at home for as long as I can remember, slowly changing the recipe along the way, making them healthier and perfect in taste and texture. I really don’t know where to start when talking about Dosa. I simply love it! I love how quick and easy it is to prepare the batter, how healthy it is, and all the different ways in which you can enjoy it. But most importantly, I love how it’s everyone enjoys it. To this day, I don’t think I’ve met a single person who doesn’t like Dosa (but if you are one of those people, I’d love to know why???). Did I mention that the batter is also freezable? Yep, it is. This is a great meal for the family, and if you ask my 3 and 5 yr old what they want for dinner, their answer will most definitely be, “Can you make DOSA?!”. 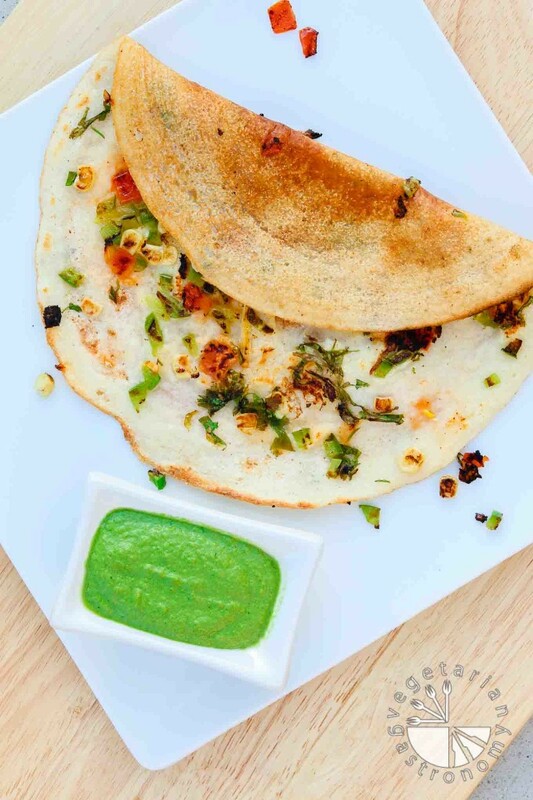 Plain Dosa (shown below) – Thin Dosa served with a side of your favorite chutney (such as Cilantro Peanut Chutney), sauce, or vegan butter (which is what my kids enjoy). For Kids – Shred some veggies such as zucchini/squash and carrots into the batter before making the Dosa to add more nutrition. 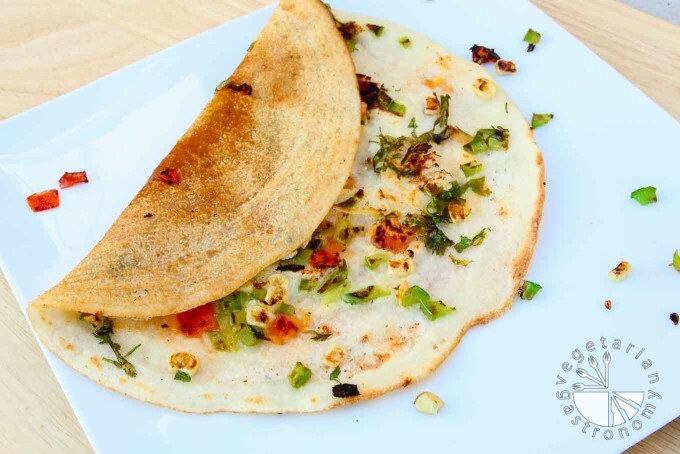 Uttapam Dosa (shown above) – Make a slightly thicker Dosa and top it with some finely chopped cilantro, jalapenos, bell peppers, tomatoes, onions, and/or corn while cooking on the pan. You can see that this dish is very versatile. I’ve had all the versions listed above, and enjoy every one of them. It’s also perfect to pack for your kids lunches. I make the batter ahead of time with shredded veggies, cook the Dosa before school, spread a little vegan butter on it, cut it up into pieces or roll it up, and pack it for their lunch. It’s always a huge hit! Whenever my kids take Dosa, I know they will come back with empty lunch containers, which makes a mom like me very happy. If you’re looking at the recipe and thinking that you won’t be able to perfectly pour and shape the batter, don’t worry. It’s very easy and doesn’t require any special cooking tools or skills, just may take a little practice and a good non-stick pan. You can check out the pan I’ve been using for years on my SHOP Page, or here. The recipe itself is very easy, and I’ve tried to be as detailed as possible below in the directions. Plus, I made a video below to show you how I spread the batter (my very first video!). So get to it! If you’re a pro at making Dosa, then take this recipe and run with it. If you’re a first timer, then make a small batch of the Dosa mix, and try your hand at making your very own home-made Dosa. If you try out the recipe, I’d love to hear from you in the comments below. Or tag me on Facebook or Instagram so I can see your creations. 3 ingredients and you have yourself a delicious healthy family-friendly savory dish! Enjoy it for breakfast lunch, or dinner, make it for school lunch, or freeze leftover batter for a quick meal! Combine the long-grain white rice, skinned and split urad dal, and green split lentils in a mixing bowl. Rinse them with water a few times, and soak them in enough water for at least 4 hours (I typically soak overnight if I remember). After soaking, drain the lentils and rice and blend along with 1 cup of water (I use my vitamix, but any blender will work just fine). Blend until mostly smooth but keep the batter a little grainy to give some extra texture when making the Dosa (if in doubt, you can just blend until completely smooth to be safe. Both ways will taste great as long as you don’t have large pieces of rice and lentils still remaining in the batter). You should have a medium-thick batter that is pour-able. If you feel your batter is too thick, add a little more water. Transfer the batter into a deep bowl, add enough salt to taste (a good amount), and mix well. At this point, most people will cover the batter and leave it at room temperature covered for 4-6 hours to allow it to ferment, but you can skip this step if you don't have time or care for the fermentation flavor. If you decide to ferment the batter, taste again for salt after it’s done. You now have the basic Dosa batter made. The key to making a good Dosa is working fast, having the right non-stick pan, and temperature control, otherwise your Dosa will stick to the pan. Read through the entire directions before starting. Pre-heat your large non-stick pan on medium heat. Once your pan is pre-heated, sprinkle a little water on the heated pan and quickly wipe it off gently using a paper napkin (this step is very important). 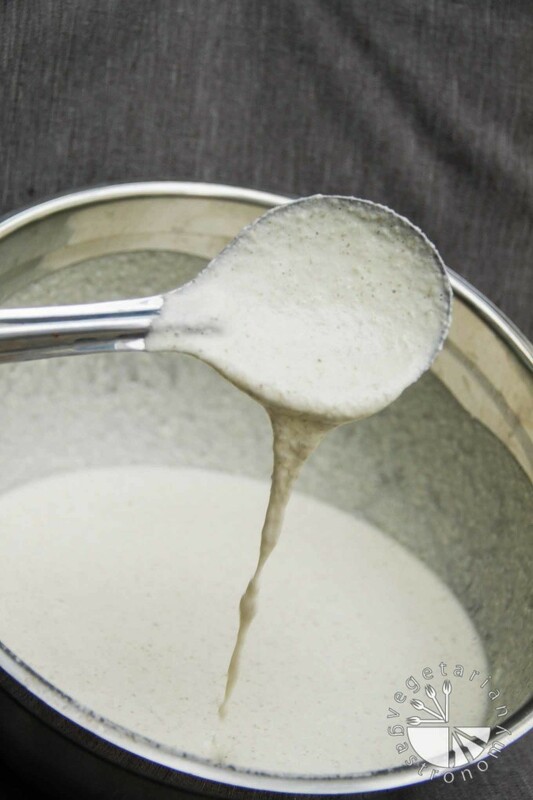 Using a large spoon or ladle (make sure it’s something easy to work with), pour a spoonful or two (more or less depending on the size of your spoon and pan) of the batter in the center of the pan. When you pour the batter on the pan, it should sizzle a little. But if the batter starts to bubble up quickly, the pan is too hot and it will be difficult to spread the batter out into a thin circle. 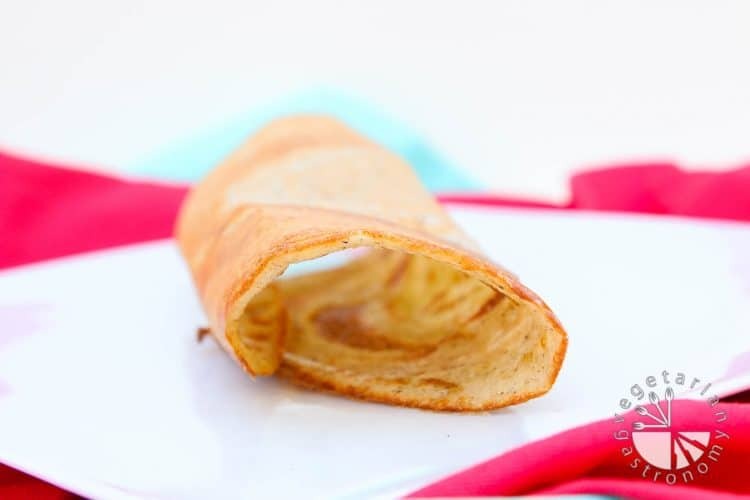 Using the bottom of the ladle, work very quickly and spread the batter outwards in a circular motion, starting from the center and working your way out to make a thin round dosa. Drizzle a little cooking oil over the top and edges and a tiny bit in the middle of the dosa batter. Cook on medium heat until the Dosa starts to brown and outer edges begin to look dry (about 2 minutes). Using a spatula, carefully loosen the dosa from the pan, flip it over, and cook for an additional 1 minute. The bottom cooked part of the dosa (now facing up) should be nicely browned and crisp. Fold the Dosa over, remove from the pan, and serve with your favorite chutney (such as the Cilantro Peanut Chutney ) and/or masala potatoes. Repeat with the remaining batter to make 10-12 Dosas. Be sure to wipe the pan down quickly with a wet napkin in between each Dosa to control the temperature. You can store any remaining batter the freezer and simply place it in the fridge 24 hours to defrost prior to using. Thin with water if necessary. Here are several options on different types of Dosa you can make once you have your batter. Variations to this traditional Basic Plain Dosa recipe are outlined below. For Kids - Mix in some finely shredded carrots, zucchini, and/or yellow squash into the batter prior to making the Dosa. Depending on how many veggies you add in, you may need to spread the Dosa slightly thicker. 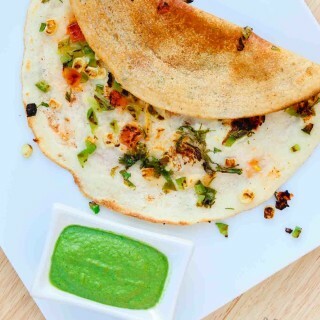 Masala Dosa - Once the Dosa is made, add a spoonful of Lemony Potato Masala to the center strip of the Dosa and then fold over and serve with Cilantro Peanut Chutney . Utapam - Once you pour the batter onto the middle of the pan, make a slightly thicker Dosa. Immediately sprinkle some finely chopped onions, cilantro, corn, tomatoes, and/or fresh jalapenos on top before the Dosa starts to cook so that it will stick to the spread Dosa batter. Then continue to follow the instructions as indicated above. Making Dosa - If this is your first time making Dosa, you may have a few trial and errors before you perfect the process, but I promise it’s VERY simple once you get it, and super easy to make! Start off by making a small Dosa and work your way up. This recipe is very simple and basic, but I’ve tried to be as detailed as possible in the directions above on troubleshooting and how to create the perfect Dosa. The key is to work fast after you pour the batter, get a handle on pan temperature control, and dont' worry if you don't get it right on your first try! Don't forget to check out my Dosa video embedded in the post above for reference. Fermenting - If you are planning to ferment the Dosa batter, I recommend making it ahead of time. Make-Ahead Tip - Make the batter ahead of time and store in fridge for up to 1 week! You can also freeze leftover batter and simply defrost in fridge 24 hours prior to using. Nutritional Information - Correlates to a Basic Plain Dosa. Thank you!! I've been waiting to share it after my site went live! I'm super curious about these sweet ones you guys made! I'd love to do videos, just don't have the time yet. This one was random, but I ended up using it to help others get an idea of how to spread the dosa batter. You can hear my kids in the background ha! Would this work with brown rice instead of white rice? I've tried subbing half of the rice amount with brown rice, and it tastes great! Basically the answer is yes, you can substitute with brown rice (or even some quinoa), but the texture of the dosa will be slightly different, although still good if you're ok with it! This recipe is so easy, so definitely give it a try! Let me know what you think! Thank you so much Vivian! 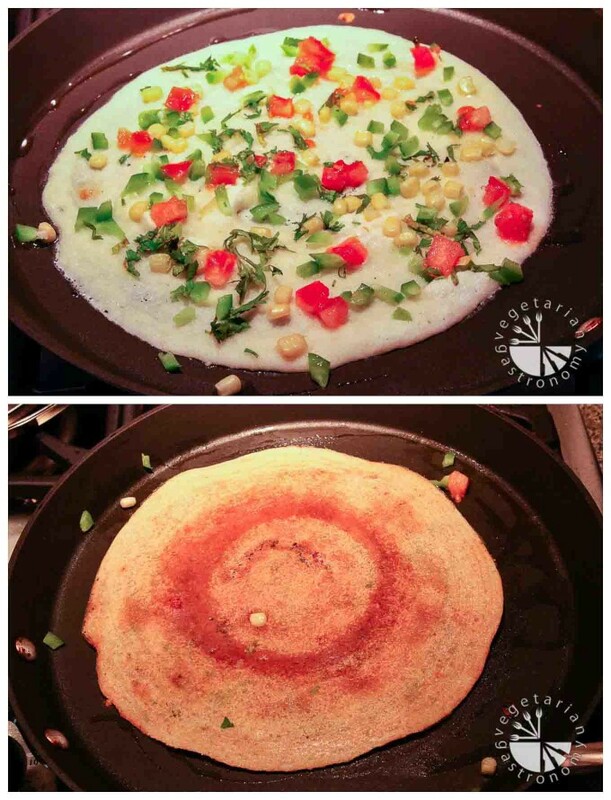 Making dosa is SO easy, and I really wanted that to be apparent with this post. The batter is quick to make, healthy, and freezable too! You basically eat it like a crepe. You can stuff the filling inside and fold it over like a open burrito, or tear pieces off of the cooked dosa and use it like tortilla to enjoy with the filling. If you're adding veggies to it, then I typically enjoy as is and dip it in a coconut based chutney or my cilantro peanut chutney recipe. Hope all that helps! Let me know if you have any other questions! Dosa and your lemon potato does together very well.